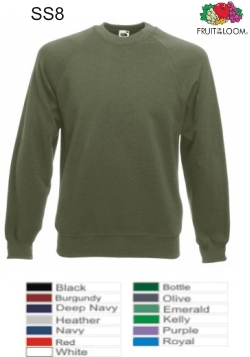 This popular Fruit of the Loom sweatshirt is available in a wide range of colours. It is hard wearing and can be printed or embroidered with your logo design. which ensure this product retains its shape after washing. Made from 80% cotton and 20% polyester. 2 of 2 (100%) reviewers would recommend this product. I found the staff at shirtattack very knowledgeable and helpful. The sweatshirts were good quality and value for money. Shirts arrived on time and our staff were happy with the quality will use the company again.